Exchange public folder sync for calendars, contacts, tasks, posts/mail. Sync your global address list (GAL) to mobiles. Easily sync Microsoft Exchange public folder calendars and contacts with your team’s personal folders for viewing on smartphones and mobiles – iPhones, Androids. Tailor the software to meet your sync needs. Take control – you decide who can view, add, modify and/or delete items. Set up a 1 way, 2 way or full mesh (all around) sync. Supports tasks, posts, notes folder sync. Use our calendar sync software to easily manage appointments, meetings, and even schedule resources –conference or meeting rooms. Create an Exchange group calendar from users personal calendars. Set up a calendar sync for different departments to specific users, or even between two users’ personal calendars. Feature rich and versatile to support many different sync scenarios. STAY IN SYNC AT THE OFFICE AND ON THE GO! Need a Microsoft Exchange public folder sync or Office 365 sync solution for mobility? Let’s face it, you can’t be in the office all the time and mobile devices are all around us. 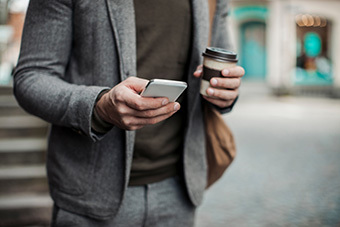 Walk by any public place, whether it’s the courthouse, a medical facility, an airport, a restaurant, and you’ll often see a professional using their mobile device. Mobile usage has transformed the way we interact and conduct business today. Business executives and professionals are relying on their mobile devices to stay in tune with what’s happening at the office. Our sync software helps you better collaborate and share information with your team. Access calendar appointments and contacts when you’re away from the office. Regardless of your platform (on-premise Exchange, Office 365, a hybrid platform), we have a solution for you! We’re confident we have a sync solution that’s right for you and your organization. Take a minute or two to learn more about our innovative solutions and contact us with any questions. We’re here to help! Platforms supported: on-premise Exchange Server 2019, 2016, 2013 and prior versions. Ask about Add2Exchange 365 for Office 365, hosted Exchange, and hybrid platforms. Synchronize calendar and contacts across mailboxes and Exchange public folders. Compatible with mobile devices which sync with your mailbox. Sync global address list to mobiles. Support tasks, posts/mail and notes folders, too! Sync between two different Office 365 tenants or between two different Exchange Servers with no trust. Sync between two local PST files, or sync a PST file with hosted Exchange public folder. Platforms supported: Office 365, hosted Exchange, hybrid, on-prem Exchange. Works with mobiles via Exchange ActiveSync or BES. Sync calendar and contacts between personal and Exchange public folders, or GAL sync to mobiles. Whether you’re looking for a hosted option to sync your Microsoft Exchange public folders with Outlook calendars and contacts or you use Office 365 and need to sync the GAL to mobiles, we have a hosted solution for you. Why Use DidItBetter Software Solutions? We’ve been in business since 1988 and have seen the advancement of enterprise mobile technology in the workplace. Our solutions fill a void in Microsoft Exchange and Office 365 products. Here are a few reasons we feel our solutions are just better. Versatile, many sync scenarios supported. Tailor the software to your sync needs. For proof of concept, we offer a 21-day trial version so you can give it a try before you buy. Simplified central management and administration. Single point installation, centrally managed and deployed. Nothing to install on desktops or mobile devices! Easy to use. Our solutions work automatically in the background to sync folders based on the settings configured and process interval selected during the install and set up of the software. Scalable and affordable. We offer several licensing tiers to accommodate both small and large installations. We don’t charge you monthly per user or per device. Contact us for your licensing recommendation. Software assurance for free updates and upgrades for 1, 2 or 3 years! Email support is also included under software assurance. Responsive, knowledgeable support. When you need help, our professional techs are ready to assist with remote and phone support under Premier Support. Our techs are experienced in supporting different configurations and committed to providing you the highest level of service. Trial versions available in our Downloads area. Have questions or ready for licensing recommendation? Start a Live Chat or Call Us! Award winning software, 9 years in a row! After evaluating other solutions, Add2Exchange was the best solution for us to synchronize between our Exchange public folders — calendars and contacts — to our personal folders for viewing on our iPhones, iPads and Androids…responsive support and great upgrade assurance program. Jim C.
Thanks for the support you gave me in migrating the Add2Exchange product to my new server environment…it was a bit more involved than I originally planned, but your technical support helped me through this to make sure my transition was complete. Excellent job! And I for one am very happy to have this project off my desk. John G.